How do I add a Vocabulary quiz? Vocabulary quizzes let you create vocabulary terms and definitions. 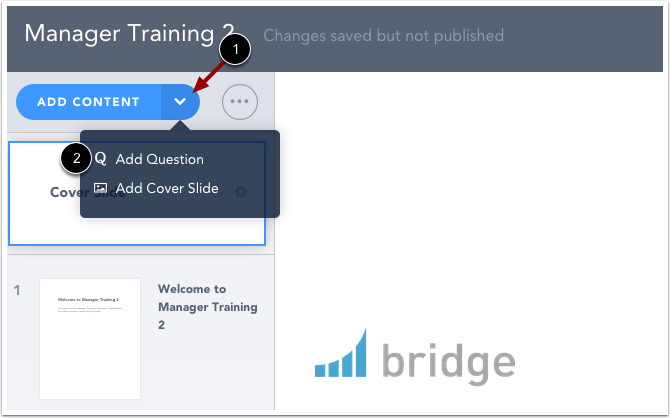 Bridge uses your entries to automatically create random questions for your learners. See how learners view vocabulary quizzes. Learners will also see Vocabulary quiz questions in follow-up Bridge Retain exercises if Retain is enabled for a course. Click the Vocabulary quiz type. In the first text box, enter the vocabulary term. In the second text box, enter the term's definition. To add another vocabulary term and definition, click the Add Answer link . To add learner feedback to your quiz, click the Customize Learner Feedback menu . To remove an entry, locate the entry and click the Remove icon . Note: Removing an entry is immediate and cannot be undone. Previous Topic:What do quizzes look like in my course? Next Topic:How do I add a Steps in a Process (ordered list) quiz? Table of Contents > Manage Courses > How do I add a Vocabulary quiz?